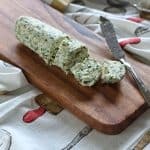 This Shallot Herb Compound Butter is so easy to prepare and will give new life to everything from your favorite steak to sauteed vegetables. Make it ahead and keep it in the freezer for a quick dinner shortcut. Every once in awhile an idea is so simple that I forget to share it with everyone else. 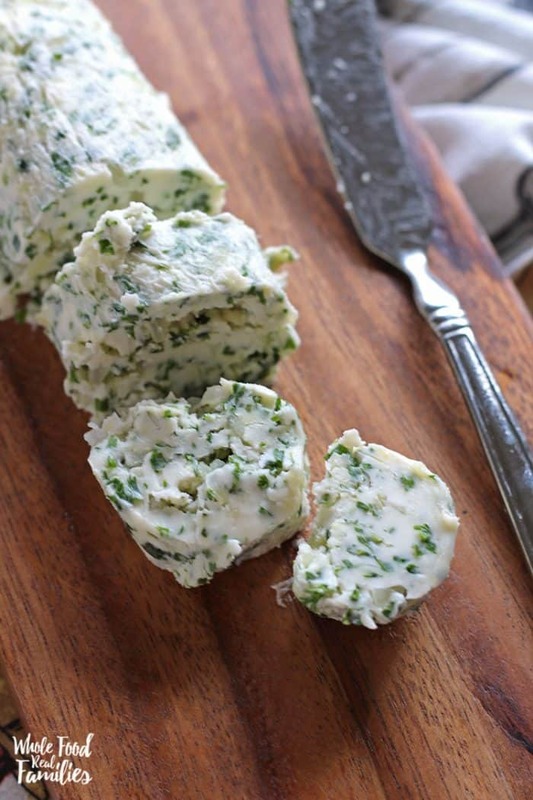 Shallot Herb Compound Butter is one of those ideas. It is as simple as a quick sautee folded into soft butter and cooled again. But have a slice of this compound butter on a steak hot off the grill and it is just magical. Last summer, we were vacationing with extended family and because we actually LIKE to cook, my husband and I handled a great deal of the group meals. (We like to cook… crazy, right?!) We were all excited about the idea of a steak dinner. But when I started sauteeing garlic and shallots and chopping green things, I got some skeptical looks. Polite, but not exactly adventurous eaters, our family sat down at the table looking a little sad that I was mucking up their steak. By the end of the meal, everyone was making muffled yummmmm noises while chewing and wiping up the melted butter with the rest of their steaks. The flavors in this Shallot Herb Compound Butter are not going to overpower your dish – but they will elevate it to crazy delicious. So many varieties of sauteed vegetables pass across my kitchen table every week. Aside from being important for a healthy diet and delicious – sauteed veggies are also pretty easy and fast to prepare. That makes them perfect for weeknight dinners when my full-time job of being a food blogger meets my other full-time job of kid wrangling. Getting sick of the same veggies? Need something new to dress them up and make them interesting again? This Shallot Herb Compound Butter is so easy to prepare and will give new life to everything from your favorite steak to sauteed vegetables. Let 2 sticks of butter soften on the counter. Do not use the microwave to soften or melt the butter! Add 1 tbsp olive oil to a small sauté pan and warm over medium heat. Add shallots and allow them to soften for 2-3 minutes, stirring occasionally. Add minced garlic and let the mixture cook for an additional 1 minute until garlic is fragrant and soft. Remove from heat. Add sticks of softened butter to a small bowl. Add cooked shallot and garlic. Also add minced chives, parsley and 1 tsp salt (you will use less if your butter is salted) Using a rubber spatula, gently fold the ingredients into the butter until well combined. Turn out butter onto a square of plastic wrap and form a log with the butter. Wrap it up, twist the ends and pop the compound butter into the fridge for at least 2 hours to let it become firm again. Add a thick slice of butter to hot steak, fish, or sautéed veggies! Shallot Herb Compound Butter for the Win! Interested? 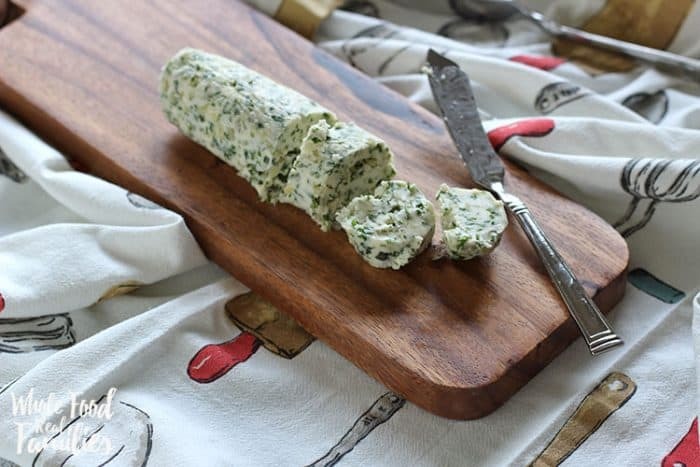 Looking for ways to use this Shallot Herb Compound Butter next week? 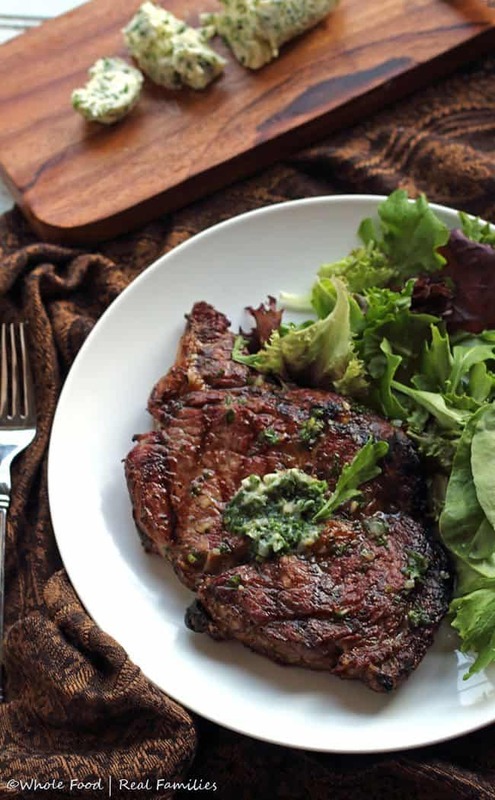 Let’s talk about this Grilled Ribeye Steak! Need more choices? 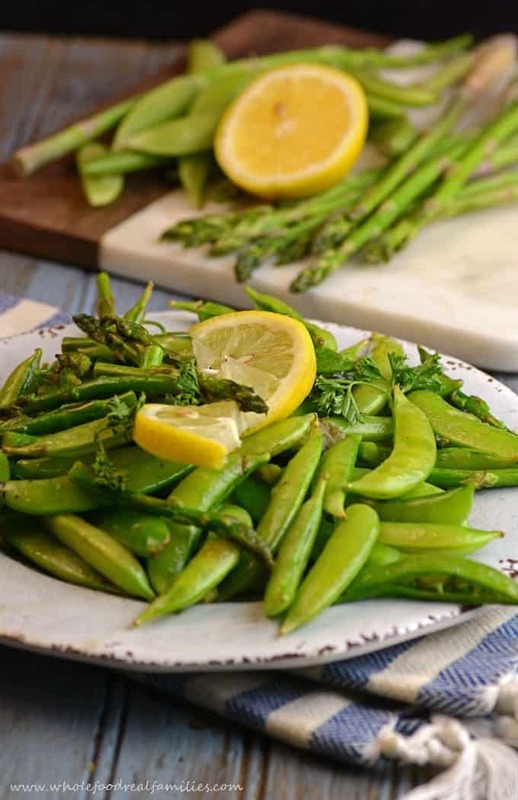 How about Sauteed Snap Peas and Asparagus! Cynthia is a writer, photographer, and recipe developer. She was in corporate marketing for 15 years before leaving it to focus on family. She started blogging as a way to nourish the desire to work while balancing the joys and duties that come with having more kids than hands. She is married to an aerospace engineer who likes to man the grill and has 3 daughters – a teenager and two toddlers. Follow her on Facebook, Pinterest, Instagram, and Twitter. Please make your recipes printable…we won’t have to waste full sheets of paper then…thanks.